most weekdays, my husband + i just make a quick breakfast – nothing fancy. so, we both look forward to the weekends, when we can take the time to make a big, hearty, leisurely breakfast. this past weekend i woke up with a major hankering for biscuits, so, i gathered up the ingredients for these delicious little numbers, + set about making a delicious meal of eggs, bacon, biscuits, + jam. a huge thanks goes to fab fellow food blogger erin, who shared this delicious recipe with me. a born + raised southerner, i knew she’d have the perfect buttermilk biscuit recipe, + she did! thanks, erin! preheat oven to 425 degrees. combine flour, salt, + baking powder in a bowl or in a food processor, then add in butter with a pastry blender or fork, or pulse in the food processor until the mixture looks like coarse cornmeal. slowly add buttermilk, gently stirring with a rubber spatula or your fingers; add just enough so that it turns into dough. roll the dough out to 1/2” thickness, then cut out biscuits with a ring mold (or drinking glass). place biscuits on a parchment-lined or silpat-lined baking sheet, + brush the tops with melted butter. bake until just starting to turn golden, about 15 minutes. Oh those really do look just absolutely perfect. 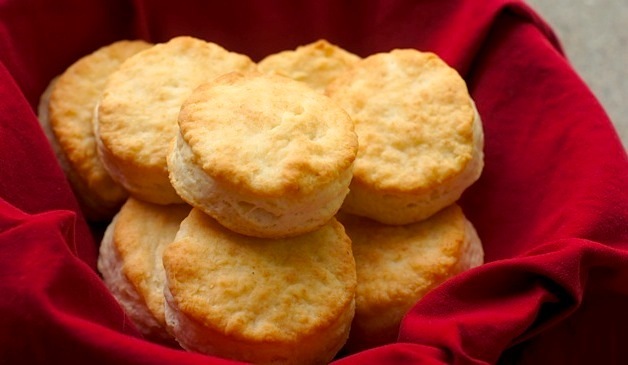 LOVE the fluffy, flaky, doughy texture to biscuits. SO good. they are perfection! i’m going to play around with adding in savory ingredients – maybe cheddar, chives, etc. – but i’ll be keeping the basic recipe exactly the same. they just turned out so wonderful! I am bookmarking these for sure! My anniversary is coming up and my husband LOVES biscuits and gravy, so I usually make them for him…but I have to admit, my biscuits don’t always turn out so perfect! He eats them anyway, though, ha ha! But these look fabulous, and easy, and PERFECT, so I’m using this recipe this year! Beautiful! awesome! i had no idea they were going to be so easy to make – i always thought biscuits could be finicky, you know? apparently this is the perfect recipe, though – can’t wait to hear how they turn out for you and your husband! you’ll have to share your gravy recipe, too! I LOVE biscuits…with everything…especially gravy! So glad you’re onto our Southern trend now! PS – if you put some grated Kenny’s norwood cheese and a few snipped chives into the butter/flour mixture before you add buttermilk, you would have an amazing variation! i’ve never made my own gravy for biscuits + gravy so that’ll be my next southern cooking endeavor. if you have a great recipe, feel free to share! i absolutely love your variation idea with Kenny’s norwood cheese + chives. that’s exactly the type of variation i was envisioning! would be great with chili. or with some fried chicken! i’m right there with ya! once i made these i thought, why did it take me so long to make biscuits? especially shameful, having lived in the South for 10+ years. =) i can’t wait to hear how they turn out with you. they’d be awesome with chicken + gravy! These look good. It’s making me want to run to Popeye’s for lunch just for the biscuits. What a lovely way to spend a Sunday: food and family. These biscuits look so delicious! these are truly gorgeous and making me long for an afternoon on the couch with a big bowl of chili while watching multi-colored leaves bristle on by my terrace door. I cannot wait to try them!! how fantastic does that sound?! that’s one thing i miss since moving from boston to nashville – the gorgeous fall foliage! my husband suggested we travel up north this fall to do some ‘leaf-peeping’ as he puts it + i think i might take him up on the idea! ooh, i didn’t realize that you had a gravy recipe, too! thank you so much for both recipes. don’t be surprised if my husband sends you flowers one of these days to thank you for helping me southernify my cooking skills! Oh yea! Now I have another reason to play with my food processor. It looks like it is biscuit time!! renee, i used my food processor for these rather than doing it by hand + it make the dough a cinch to make. you’re gonna love these! These DO look like the perfect biscuits! aww, thanks erin. they did turn out awfully purty! Okay, I’m going to be your one detractor–I don’t like flaky biscuits! I like poofy, crumbly biscuits like the Cracker Barrel biscuits. It drives me nuts to see layers in a biscuit and I’m not sure why! However, I will say those are some very pretty biscuits! These look delish Amy! That recipe is pretty similar to my Great-Grandmother’s too. Nothing better than southern biscuits! how fab that it’s similar to your great-grandma’s recipes – some of the best recipes are traditional ones that have stood the test of time! Looks delicious and one more recipe for me I have bookmarked few of your recipes and now this one too! Also good suggestion Vivek! I make mine with goat cheese, onions and some seasoning. Love it with my evening tea. Just found your blog, and I’m so glad! Can’t wait to check out all your recipes! i’m happy you found your way over here, jess – i love meeting new bloggers. off to check out your site! I love homemade biscuits. I know what I am making tonight!! I’ll have to give your recipe a try! Those would be perfect with chicken pot pie! and the weather’s just about to cool off enough for chicken pot pie, too. i like the way you think! One look at your intro picture, and I was instantly hungry. I haven’t had a biscuit in FOREVER…..they just aren’t as commonplace in this Yankee town. i hear ya – i grew up in Boston + only ate biscuits a handful of times before moving down to Tennessee for college. i’m pretty sure i never had a homemade ones before living in the south, either – only the ol’ pillsbury grands in a can! you are so welcome, steph! can’t wait to hear how they turn out for you – the kiddos can even help a bit with ’em! oh wow, you’re right -those do look PERFECT!!! you are so sweet – thank you so much! They are so perfect! Yum! Amy, I meant to tell you–I made these last weekend for my anniversary, and they were FABULOUS. I’ve never had much success with homemade biscuits, but these were a cinch (and a big hit with the hubby)! Thanks so much for the post! Can you double or do you need to make one recipe worth at a time? To keep the kneading minimal..
Hi Sharon! I haven’t tried doubling the recipe but you should be able to, no problem. Just be mindful to still only knead it 4 times – not overworking the dough is critical to these awesome biscuits. Report back how it goes if you double it!